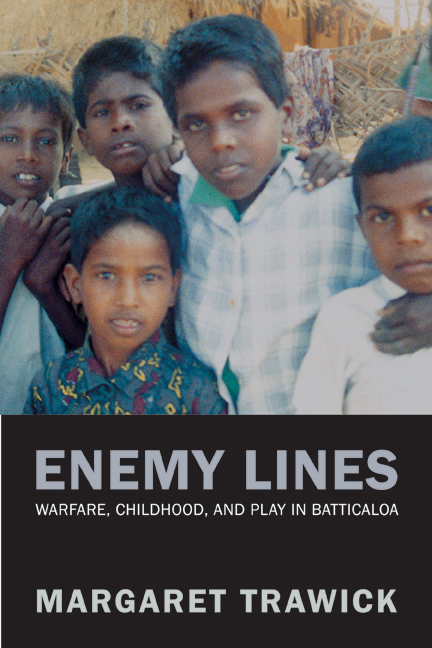 Enemy Lines captures the extraordinary story of boys and girls coming of age during a civil war. Margaret Trawick lived and worked in Batticaloa in eastern Sri Lanka, where thousands of youths have been recruited into the Sri Lankan armed resistance movement known as the Tamil Tigers. This compelling account of her experiences is a powerful exploration of how children respond to the presence of war and how adults have responded to the presence of children in this conflict. Her beautifully written account, which includes voices of the teenagers and young adults who have joined the Tamil Tigers, brings alive a region where childhood, warfare, and play have become commingled in a world of continuous uncertainty. Margaret Trawick is Professor of Social Anthropology at Massey University in New Zealand. She is author of Notes on Love in a Tamil Family (UC Press).